Bus from Malacca to Klang is one of the reliable choice of transport to travel to Klang from Malacca. 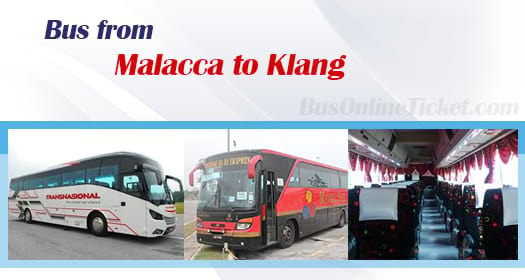 Many locals prefer to take direct bus from Malacca to Klang is because taking bus from Malacca to Kuala Lumpur requires passengers to transfer bus or KTM from Kuala Lumpur city to Klang. Transnasional and Mayang Sari Express are two operators serving bus from Malacca to Klang. Transnasional provides 4 daily trips from Malacca to Klang while Mayang Sari only provides 3 daily trips. Transnasional is operating this bus route with standard 40-seater coach while Mayang Sari serves this bus route with VIP 30-seater coach. Their first bus service starts in the morning 8:30am. The following schedule are 9:45am, 12:30pm, 2:45pm, 4:40pm,7:45pm, and 8:15pm. The travel time from Malacca to Klang is about 3 hours depending on the road traffic and weather conditions. One short stopover for toilet break will be given upon request from the driver during the journey. The bus fare from Malacca to Klang costs in a range of RM 16.90 to RM 17.00 depending on your choice of bus operator. Mayang Sari is offering child fare for this bus route at RM 12.70. The pick up in Malacca is located at Melaka Sentral Bus Terminal, the largest public transportation in Malacca city. The drop off point in Klang is located at Klang Sentral Bus Terminal. Due to limited seats available from Malacca to Klang, passengers are encouraged to book your bus ticket in advance to avoid. Online booking with BusOnlineTicket.com can help you to save your money and time to travel to Melaka Sentral Bus Terminal to buy ticket over the counter. Book your ticket now at BusOnlineTicket.com, you will receive confirmation email instantly after payment is done.